The timing of the gathering (the rapture): pre or post? There’s this idea circulating in the Church that the Church will be gathered to Christ (raptured) before the Tribulation begins. However, Daniel says otherwise. At what time? It tells us right in the first verse “a time of distress” as in the Tribulation. The previous chapter tells us as well. Rescued by who? By Jesus Christ who is returning! Who is being rescued? Everyone who is found written in the Book as in believers as in the Church! “Many of those who sleep in the dust of the ground will awake, these to everlasting life, but the others to disgrace and everlasting contempt. “Those who have insight will shine brightly like the brightness of the expanse of heaven, and those who lead the many to righteousness, like the stars forever and ever. And here in verse 2 we have the resurrection of the Saints, which the gathering of those who are alive on the earth at this time (the rapture), is a part of [1 Corinthians 15]. The rapture is the part of the resurrection for those who will be alive at the time of Christ’s return to be gathered to Him. Those who are dead in Him are already with Him [1 Thessalonians 4:13-18]. It is of utmost importance to note that when Christ returns the Tribulation ends. That’s why He’s returning! He’s returning to put an end to the most tyrannical regime in history and rescue His Church! Hi, I’m post-trib myself. Thanks to God that there are more like me. Do you teach on the largely ignored issue of The Apostasy? I believe that this will be the most profound church dividing event in Christian history. God bless you brother. i’ve never written anything specifically mentioning the Apostasy but i believe it will be more than just a general turning away from God as all worldwide religions encourage including atheism. i think the Apostasy is specifically Islam, the mother of all cults/harlots [Revelation 17:5-6] from which the Antichrist will come that is even now deluding people into believing it’s peaceful and true [2 Thessalonians 2:8-12] including most every one of our politicians, unfortunately. Hi, I agree that there is and will be world wide apostasy among all false religions, the Jews and the pagan world alike. But I believe the apostasy Paul referred to in 2 Thessalonians 2 is one specific to Christendom. I think we have seen signs of it in the history of Christianity with the plethora of heretical teaching that abounds among professing churches. But I believe that an apostasy such as has never been seen will usher in the man of sin. The emerging church with it’s seeker friendly stance, along with the Word Of Faith folks, is watering down the true Gospel with it’s New Age religion of LOVE at the expense of the truth. These theologically liberal lies are more and more practiced by the apostate church and pagans as well. I would guess that those who follow these heresies are also the same 90% of professing believers who expect to be whisked away at the (any moment) rapture. Dan. 12:1 starts by telling us, “At that time…” what time? The time just referenced in the preceding chapter where an empire covers a vast area, but does not include Ammon, Moab,….Dan 11:40,41 Who is that empire? Daniel 11 reads like a history book, starts with the Greeks and ends with the Roman Empire which came to the boarders of the three areas mentioned in Dan. 11:40,41 (I’m being lazy going from memory..it’s one of the 2 verses). We are told of a time of distress unlike no other. Is this exclusive to Israel? If it is it also parallels Jer. 30:7 and Matt. 24:21, and one in Joel 2. In Jer. 30:7 we are told of the time of “Jacob’s trouble” and most automatically think the “great tribulation” because that is how we have been brainwashed. However, if you actually read the two chapter prophesy Jer. 30,31 you understand that this period of time brings about a scattering of the Jews (Jer. 30:10,11) to the ends of the Earth where she has been gathered…(Jer. 31:8). At the time when Messiah returns the Jews will not be scattered, but they will indeed occupy Jerusalem… Zech 12:1-3. Some of Jerusalem will be in captivity, but not scattered as the time of Jacob’s trouble tells us. Israel has only been scattered once in their history it started in 70 AD during the Roman Empire rule. By 162 AD Jerusalem was considered “Jew free” and eradicated of all Jews. This was indeed the worst time ever for Israel, and they were indeed scattered to the ends of the Earth. They begin to be gathered in 1948 where Israel was again given their nation back, and the gathering has continued to this day. Isaiah tells us that once she is gathered she will never be scattered again. Can the time of Jacob’s trouble be the great tribulation….NO. it cannot. The worst case scenario for Israel is in her past, and her future looks brighter. The Olivet Discourse starts out by the disciples commenting to Jesus concerning the beauty of the architecture of the temple. Jesus responds that “not one stone will be left upon another…” The disciples then ask Jesus, “When will these things be…?” We are well aware that when Titus brought his Roman armies to squelch the uprising in Israel the temple was burnt melting the gold between the stones and the gold seekers removed every stone until not one was left upon another fulfilling the words of Jesus. This happened in 70 AD. The disciples specifically asked Jesus concerning THIS time, “When will these things be…?” Jesus responded to them… Matt. 24:15-21, we are specifically told concerning the abomination of desolation and that it would be the worst time ever for Israel. This tells us that the worst time for Israel coincides with the time of Jacob’s trouble during the Roman Empire rule. The first time the abomination of desolation happened was 167 B.C. at which time a different conquer (with a long name) defiled the temple by sacrificing a pig on the alter. When it is written concerning the abomination of desolation in Matt. 24:15…”let the readers understand” The readers were well aware of the abominable acts of the conquer had done in 167 B.C. and it was not news to them when Titus also did the abominable act of gentiles defiling the temple by going where it was abominable for them to go in the inner courts. The decimated the temple to the point of total destruction. Titus made a covenant with the Roman Empire to squelch the Jewish rebellion in 66 AD. Three and half years later it ended in 70 AD with the destruction of the temple thus ending the daily sacrifices. These daily sacrifices were brought to an end and have been ended for nearly 2000 years. This fulfills Daniel 9:27 completely. However, the pretrib doctrine attempts to inform everyone that there is a huge gap in time (nearly 2000 years, and climbing) between the 69th week and the 70th week in Daniel’s prophesy. Hello…wake up… the daily sacrifices have ENDED! Jesus Himself became the perfect sacrifice, and the need for sacrifice ended with Him. There is no mysterious reason to start them up in the future again. This history is very straight forward and easily tracked Scripturally. Why then is it necessary for the pretrib doctrine to tell us that these prophesies are unfulfilled? Does it effect the timing of the rapture? Where is the connection? You see, without being able to separate the the Jew from the church there becomes a huge problem. Paul tells us that the wall of separation have come down…Eph 2:11-14, and the Word tells us that we are one body in Christ Jesus. But without rebuilding these walls of separation and dividing the body into Israel and the church you have no grounds for separating the rapture from the second coming. However, if you can make an argument for this separation then the doctrine can pick and choose which verses it wants for Israel, and which verses it wants to apply for the church. Interesting how all the undesirable verses get dumped onto the Jews. The fact of the matter is that if you separate the rapture from the second coming. The first event would declare the timing of the second coming. Jesus declares that He is coming “as a thief…” concerning the second coming… Rev. 16:15, 2 Peter 3;10. Jesus is not a liar. He is coming like a thief. If a rapture took place 7 years prior, “the goodman of the house” would know at what hour to keep watch…Matt. 24;41,42. Jesus is not the liar. The separation between the rapture and the second coming is the lie. There is great controversy regarding when the body of Christ will be gathered to the Lord. I personally believe the body of Christ will be resurrected at the 7th trumpet, which is in the middle of the tribulation. Simply because that is what verses in the New Testament state. First of all one needs to understand the mystery of God that is mentioned in Re 10:7. The mystery of God is Christ in you the hope of glory. Read 1 Co 15:51, Col 1:26&27. This of course agrees with what Paul states in Thessalonians. Further information is given by Paul in 1 Co 15:52. So it is clear to me that the body of Christ is gathered to the Lord at the 7th trumpet. One scripture verse in Revelation will perhaps show why there is confusion. This woman symbolically is the same mother of us all in this verse. This woman in the 12th chapter of Revelation gives birth to the man child, who is to rule all nations with a rod of iron, Re 12:5. Many view the man child as the body of Christ joined with the head, Jesus Christ. And after that birth of the new creature the woman flees into the wilderness for 3 1/2 years. So it appears there is two parts of the woman’s seed, Re 12:17, that are resurrected at different times. Middle and end of the tribulation? I’ve never mapped out all the historical conflicts in Daniel 11. Many will say Daniel 11 happened in history and there is truth to that, yet there is a decisive switch from Antiochus Epiphanes, a type-of Antichrist, to the future Antichrist occurring as early as 11:21. 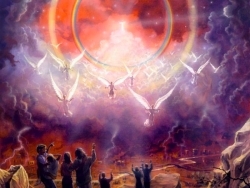 So, an interesting question is, if, as the angel tells David in Daniel 8, his entire vision is for the end time [8:17, 8:19, etc.] then, does that mean the entirety of chapter 11 has an end-time fulfillment, too because the whole of chapter 8 takes place in the first 3 verses of Daniel 11 [11:1-4]? If so, the detail is stunning.